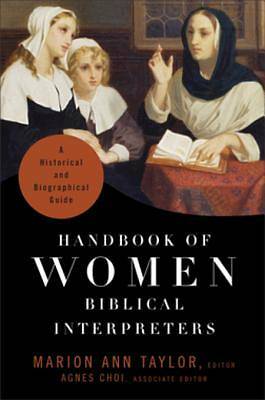 The history of women interpreters of the Bible is a neglected area of study. Marion Taylor presents a one-volume reference tool that introduces readers to a wide array of women interpreters of the Bible from the entire history of Christianity. Her research has implications for understanding biblical interpretation--especially the history of interpretation--and influencing contemporary study of women and the Bible. Contributions by 130 top scholars introduce foremothers of the faith who address issues of interpretation that continue to be relevant to faith communities today, such as women's roles in the church and synagogue and the idea of religious feminism. Women's interpretations also raise awareness about differences in the ways women and men may read the Scriptures in light of differences in their life experiences. This handbook will prove useful to ministers as well as to students of the Bible, who will be inspired, provoked, and challenged by the women introduced here. The volume will also provide a foundation for further detailed research and analysis. Interpreters include Elizabeth Rice Achtemeier, Saint Birgitta of Sweden, Catherine Mumford Booth, Anne Bradstreet, Catherine of Siena, Clare of Assisi, Egeria, Elizabeth I, Hildegard, Julian of Norwich, Therese of Lisieux, Marcella, Henrietta C. Mears, Florence Nightingale, Phoebe Palmer, Faltonia Betitia Proba, Pandita Ramabai, Christina Georgina Rossetti, Dorothy Leigh Sayers, Elizabeth Cady Stanton, Harriet Beecher Stowe, St. Teresa of Avila, Sojourner Truth, and Susanna Wesley.